Castel Brando, former Castrum Costae, is a medieval castle situated on a dolomite limestone rock at an elevation of 370 m (1,210 ft) above sea level, overlooking the villages of Cison di Valmarino and Valmareno, Northern Italy. The name Castel Brando is due to the name Brandolini, the ancient family from Forlì, who were the Lords of the castle. Castel Brando was originally built in the Roman age as a defensive fortress in order to protect the important lines of communication which connected Northern Italy to the countries on the other side of the Alps. Originally there was a garrison here protecting the territory between the Piave and the Livenza rivers in order to facilitate the safe construction of the pre-alpine part of the Via Claudia Augusta, an important Roman road, which linked the valley of the Po River with Rhaetia (modern Austria). The original castrum, dating from 46 AD is still visible today. A recent archaeological excavation has uncovered a 3 m (9.8 ft) diameter bread-oven within the castrum, dating from the same period. The original Roman baths have also been excavated, as have the original pipes of the aqueduct which supplied water from three nearby natural springs. These springs still provide water for the castle today. During the European Migration Period the fortress became an important defensive position against barbarian invasions. Over the centuries the castle has been subject to numerous enlargements and renovations. During the 13th century the castle was substantially enlarged while under the ownership of the Da Camino family, who lived there from 1233 to 1335. Their architectural additions included surrounding the castle with imposing Guelph-Ghibelline style battlements and building a central tower. Gherardo III da Camino, the great Italian feudal lord and military leader was born in the castle in 1240. The Castle’s ownership then passed over to the Republic of Venice, which awarded the Castle’s fiefdom first to Marin Faliero and then to the condottieri Giovanni Brandolino and Erasmo da Narni, better known as “Gattamelata”. After the fall of Venetian Republic in 1797, it was passed down through the family of Giovanni Brandolino and became the property of the Brandolini Counts, an ancient family from Forlì. 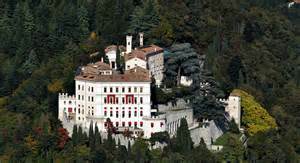 In the first half of the 16th century Antonio Maria Brandolini (1476–1522), commissioned skilled engineers to enlarge the central part of the castle in Sansovino style, adding Venetian Gothic double and triple mullioned windows. In 1700 the Brandolini family commissioned Ottavio Scotti, architect and Count of Treviso, to design and build an extension to the southern part of the castle. Part of these works included the building of a castle chapel, the Church of San Martino. The chapel was decorated internally with frescoes painted by Egidio Dall’Oglio (18th century).